Mediant 2000 front-mounted blade, 4 Span. The Mediant 2000 VoIP Gateway is a member of AudioCodes' family of market-ready, standards-compliant, media gateway systems. Designed for wireline, wireless, cable, and broadband access the Mediant 2000 is currently utilized by enterprise and service providers. This Media Gateway is intelligently packaged in a stackable 1U chassis and is the right-sized solution for small-scale needs. Incorporating AudioCodes' leading Voice over Packet technology, the Mediant 2000 enables Network Equipment Providers (NEPs) and System Integrators (SIs) rapid time-to-market and reliable cost-effective deployment of next-generation networks. The gateway is based on VoIPerfect architecture, AudioCodes' underlying best-of-breed core media gateway technology for all of its products. Deploy Right-Sized Solution The Mediant 2000 VoIP Gateway matches the density requirements for smaller locations while meeting Network Service Providers' demands for scalability. The compact Mediant 2000 VoIP Gateway scales from 1 to 16 E1/T1/J1 spans in a 1U chassis and provides a best-of-breed mediation solution for enterprise as well as carrier locations. Create Flexible Products and Services The Mediant 2000 VoIP Gateway system enables NEPs and SIs to immediately address opportunities that utilize a myriad of legacy circuit switched infrastructure features and functionalities. 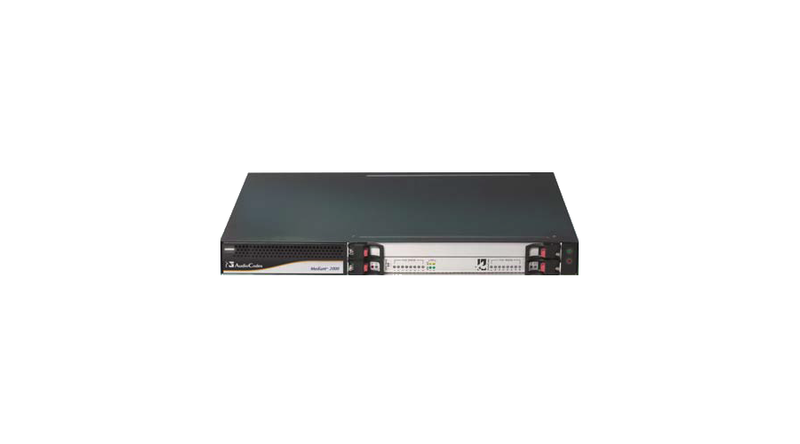 The Mediant 2000 can communicate with PBXs, PSTN, local IP Radio Access Networks, and centralized Mobile Switching Center (MSC) servers, enabling complete 2G and 3G enterprise solutions. The Mediant 2000 allows superior deployment flexibility for these solutions which include Softswitches, Cable Call Management Systems (CMS), Media Terminal Adaptors (MTAs), PacketCable solutions and Broadband Wireless Local Loop (WLL) Base Stations (WiFi, WiMax). The gateway's open platform offers NEPs the option to add one cPCI Single Board Computer (SBC) to run complementary applications within the Mediant chassis. This Media Gateway offers the enterprise a flexibility of out-of-the-box interoperability with numerous IP-PBX vendors, allowing PSTN functionality and connectivity, enriching VoIP applications such as Unified Communications and Contact Centers. Benefit from Extensive Gateway Experience AudioCodes is one of the world's leading providers of packet-enabled new voice infrastructure network technologies. AudioCodes' commitment to innovation yields consistently high-quality voice processing products that are flexible, intelligent and comprehensive.